Born into a cricket-mad family, it seems of little coincidence that Isobel Joyce would end up representing her country in their much-beloved sport. Growing up in Wicklow, a town south of Dublin, Gaelic football was the favoured sport, but the all-rounder's father and uncle spent hours listening to cricket commentary, falling in love with the game along the way. With nine children, the Joyce clan were able to field an entire XI on their own, but outside her family, Isobel hid her passion for the sport. "The county we're from - cricket was not something you advertised," Joyce recalled. "We definitely wouldn't go around telling people we played. "People here have changed their view towards cricket in the last 10 years but definitely not when I was growing up - we would hid our bats getting off the train. "I didn't regret it but we [Isobel and her twin Cecelia] played hockey at school to quite a high level and were known as the twins that played hockey rather than cricket." There was little that was going to stop Joyce playing cricket but obstacles came her way, the local club has no kids team so her father joined Merrion Cricket Club - and alongside another parent - set up an U13 side. A couple of years later an Australian couple emigrated to Ireland and once the husband joined Merrion, his wife helped set up a women's team. But, one of the memories that still sticks out in Joyce's mind from her childhood is being banned from playing in an U12 semi-final along with Cecelia as the girls that were playing in a boys side. "The other team refused to play against us if Cecelia and I played," she said. "I remember feeling very sad at not getting to play in the semi-final. "The manager of our team had asked us to play because she knew we were better than the next two best boys and we'd help the team win. "It was lucky we had each other because we would have been very scared otherwise. They changed the rules after that semi-final and it was fine from then on." Three of Joyce's brothers were keen cricketers too, and older brother Ed went on to play for Middlesex, England in limited-overs cricket and represent Ireland in their maiden Test. But there are far fewer opportunities for female Irish cricketers outside of the country - both in domestic and international cricket. Ireland Women played no T20Is between September 2016 and June 2018, and between the last Women's World T20 in India in March 2016 and the qualifiers for this year's World T20 in July 2018, they played just six matches. Joyce feels the lack of chances to play competitive cricket are stunting the growth of Irish women's cricket and she believes the younger players need to take up the fight for parity with the other international teams. "It's getting to a tricky point where something's got to give," she explained. "It's just the top eight teams getting further away from the rest of us. "Look at Zimbabwe - you can see big improvements from them over the last 12 months, it feels like Irish cricket could get left behind if things don't change. "Even with the Kia Super League and Women's Big Bash League, if you're not from South Africa, England, New Zealand or Australia, you're fighting an uphill battle to get picked up. 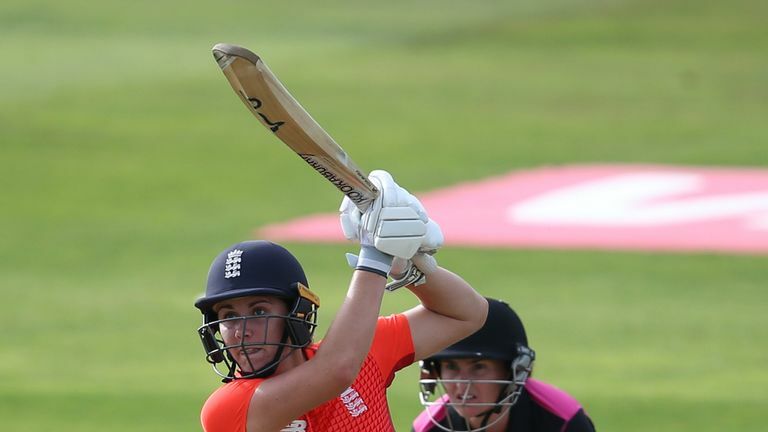 "It's not necessarily done on stats because if it was there should have been a couple of Irish people, if not in the WBBL then definitely in the KSL. "People don't take you at the same value for the same numbers, because you're Irish. For example, Kim Garth performed very well in the WBBL in the past two years and hasn't got a phone call. "It needs to change but I'm not going to hold my breath. I'm a little bit disengaged from it in a way, I don't see it as my fight anymore, it's got to be taken up by some of the younger girls in the next few years." The stars of women's cricket will go head to head in the ICC World T20 in November, with every game live on Sky Sports! Despite the lack of games and lack of time spent together as a team, Joyce has seen the women's game evolve a great deal during her 19-year career - most notably in their fitness. The 35-year-old explains Cricket Ireland have set up running and gym programs throughout the year to ensure the women are able to train sufficiently, even if they are not together. And, with a mix of youth and experience in the Irish side that will compete at the World T20 in the Caribbean, Joyce believes one of the keys to success in this month will be passing on the essentials to the younger players about playing in an international tournament. "I remember in my first World T20 in 2014 we played against Australia and although we didn't bowl particularly badly, we just didn't know the details," she said. "How specific your fields need to be and how specifically you have to bowl. "Having been through those lessons, we need to pass on the information to the players coming through. Sometimes it's just about being smarter than your opponents in T20. "If we can put a performance together on the day, we can beat any team. We haven't gone to a World T20 and really done that before. "We need to get all three aspects of the game right at the same time and it's easier for teams that train and play together all the time to do that. "We've got a bit of experience and some really exciting players - in the past we probably haven't had as much talent in the team. "We do have match-winners like Gaby Lewis, Clare Shillington, Lucy O'Reilly and Kim - we just need a few of them to perform in the same game." Watch every match from the ICC Women's World T20 live on Sky Sports from 2.30pm on Friday, 9 November.